One of the issues raised in Reporter, the documentary about Nicholas Kristof's work for the New York Times, centers on why people act when they see a person in need, and why they fail to act when they see many persons in peril. Examining research in cognitive studies, Kristoff investigates the issue of psychic numbing and emerging research into how people act when faced with images of children in need. Studies show that when people are asked to contribute to help individual children, they will give money, but when exposed to a group of children, contributions drop off considerably. Evidently people feel overwhelmed when faced with masses of people whose lives they can never really impact. But this sense of futility is not the whole story. Studies show that people will contribute in response to a little girl and a little boy separately; however when these two are pictured together, the contributions again drop. 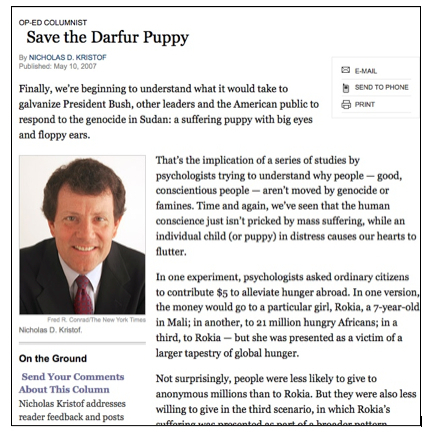 This led Kristof to write an Op Ed piece, "Save the Darfur Puppy." Kristof highlights research by Paul Slovic who outlines a "psychophysical model" to explain why it is that genocide is recurring and people participate in it or simply allow it to happen. In "'If I Look at the Mass I Will Never Act': Psychic Numbing and Genocide," Slovic notes that while the ability to report on world events has been drastically expanded over the last century, genocide continues. Slovic believes that the human capacity for empathy has not kept pace with technological innovations that allow us to view the problems of globally diverse peoples, a point raised by Jerry Mander as well, in one of the arguments for eliminating television. 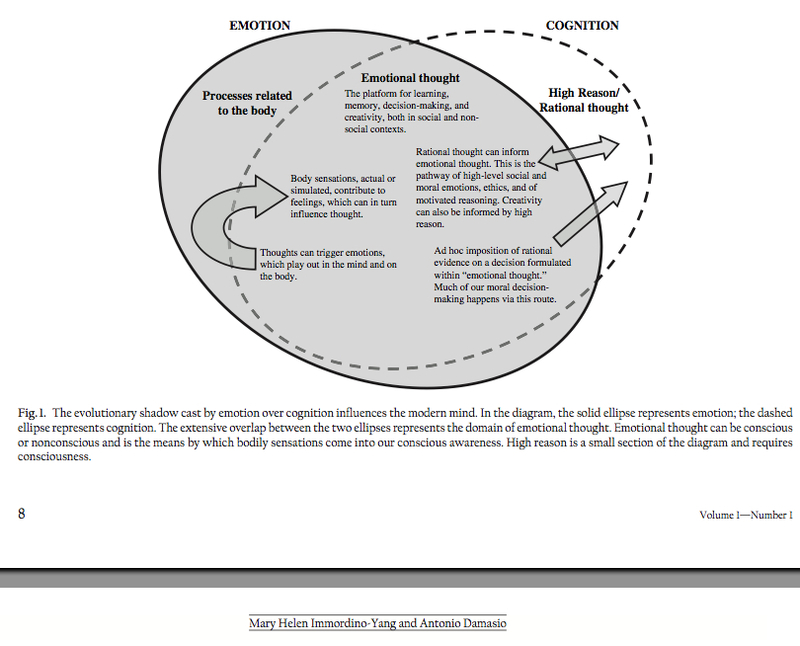 Affect is a remarkable mechanism that enabled humans to survive the long course of evolution. Before there were sophisticated analytic tools such as probability theory, scientific risk assessment, and cost/benefit calculus, humans used their senses, honed by experience, to determine whether the animal lurking in the bushes was safe to approach or the murky water in the pond was safe to drink. Simply put, System 1 thinking evolved to protect individuals and their small family and community groups from present, visible, immediate dangers. This affective system did not evolve to help us respond to distant, mass murder. As a result, System 1 thinking responds to large-scale atrocities in ways that are less than desirable. While further research is sorely needed (how might an avatar mitigate psychic numbing and breed empathy? ), for now, this issue is one we address in class and it provides some insight into the rhetorical effectiveness of highlighting a single human story before adding statistical evidence that might impact a viewer on both an affective and logical manner. Version 35 id 8152 of this page, updated 25 January 2011 by Virginia Kuhn. Created by Virginia Kuhn.